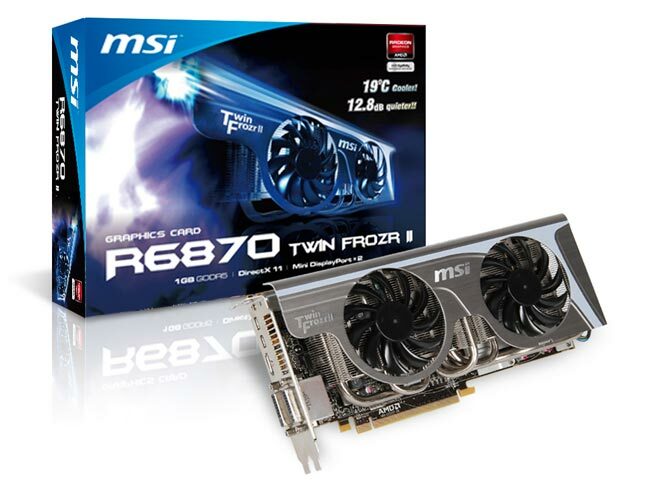 MSI has today unveiled it latest graphics card the MSI R6870 Twin Frozr II that is equipped with 40nm AMD Radeon HD6870 GPU, 1GB GDDR5 memory and cooled with the award-winning Twin Frozr II thermal solution. The Twin Frozr II allows the card to operate at a much low noise level than previous cards. With the new MSI R6870 reducing the noise produced by 12.8dB. Included software allows you to save up to 5 over clocking setups for easy access, that can set for your needs whether it be gaming, productivity or entertainment. With the Afterburner, users can further adjust the GPU voltage to break through the limit of GPU taking the card to its limit whilst still monitoring GPU temperature and fan speed. Unfortunately no price or shipping dates have been released by MSI as yet.